Want an easier way to pay? Click HERE to apply for a Smart Card today! Easter service: Bus services will operate as per timetabled services, there is no services Good Friday or Easter Monday and please note school days only timetable applies. Major stop addresses Launceston 168 Brisbane Street; Legana at Legana Grove, Exeter beside IGA travelling South, Outside Libary travelling North, Stephensons Lane Beaconsfield and Charles Street Beauty Point. GENERAL ACCESS SERVICES (GA): Our (GA) route 183 and 814 services cater for travellers from Beauty Point to Launceston and the surrounding towns of Beaconsfield, Exeter, Lanena, Rowella, Deviot, Gravelly Beach, Rosevears and Grindelwald. We provide low floor, wheelchair accessible buses on most General Access services (please confirm this by phone prior to boarding). We do not run public holidays or Sundays. SCHOOL BUSES: Our school bus service transports students from Greens Beach, Kelso, Clarence Point, Beauty Point, Beaconsfield, Rowella, Sidmouth, Deviot, Paper Beach, Gravelly Beach, Frankford, Birralee, Bridgenorth, Winkleigh, Holwell, Glengarry, Exeter, Rosevears, Grindelwald, Legana and Launceston to Beaconsfield Primary School, Exeter Primary and High Schools, all Riverside Schools, Launceston for connection to all schools as well as services to Newstead Schools including Scotch (both campuses), Newstead College and Launceston Preparatory School. TOURS & CHARTERS: If you’re planning a tour around Tasmania, our range of charter buses is designed to make your trip more enjoyable! From a small mini bus to a full size coach carrying 61 or seatbelt equipped vehicles from 13 - 53 passengers - we’ve got it covered. You can also arrange a hire/drive package to suit your budget and timeframe - contact us today to find out more. Student bus fares rose as from the 1/1/2019 to $1.80 per ride ($1.44 with smart card), $14.40 for ten rides, $115 per term $440 per annum please contact the office for term or yearly passes (credit card payments available). We are now affiliated with the Companion Card Program! 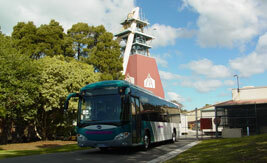 Visit local landmarks in air-conditioned comfort. 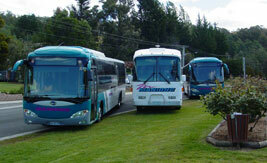 From Launceston to Beauty Point - we'll get you there on time.